A bowl of soup means different things to different people. To some, it is the ultimate comfort food, for others it is a starter, and at other times, it is the meal itself! Indeed, soup is a very versatile food. It can be light, appetizing, spicy or filling depending on the ingredients, seasonings and method of preparation. At one end of the spectrum, we have mild soups and broths, lightly seasoned with salt and pepper, while at the other end we have tongue-tickling Indian soups or shorbas that are spiced moderately, and often feature a mix of flavours including tang and spice. The Mulligatawny Soup and Makai Shorba are two classic examples. The Curd Shorba is another unmistakeably Indian creation, which is like a lighter version of the kadhi, just perfect to have as soup! There are also exotic soups borrowed from here and there, such as herby Italian ones and sweet-and-sour Oriental delights. The Paneer and Mixed Vegetable Thai Soup, the Lebanese Minty Rice Soup and the Onion Thyme Soup are amazing soups from across the world. When in a hurry, you can also make quick, no-fuss versions of all-time favourite soups like the Quick Mushroom Soup and Quick Vegetable Soup. Some soups like the Potato and Parsley Soup, or the Pumpkin and Dill Seed Soup stand out by virtue of the herbs or spices used in them, which give them a distinct, unforgettable flavour and aroma. Nowadays, many people also make a meal out of wholesome salads or soups. There are many such soups, which combine different food-groups like grains, lentils and veggies into one bowlful, which can serve as a meal by itself. Try the Lentil, Tomato and Spinach Soup or the One Meal Soup to experience the magic. Soups are an essential part of your diet when you are ill or convalescing, not only because they are comforting to taste but also because they are nourishing. 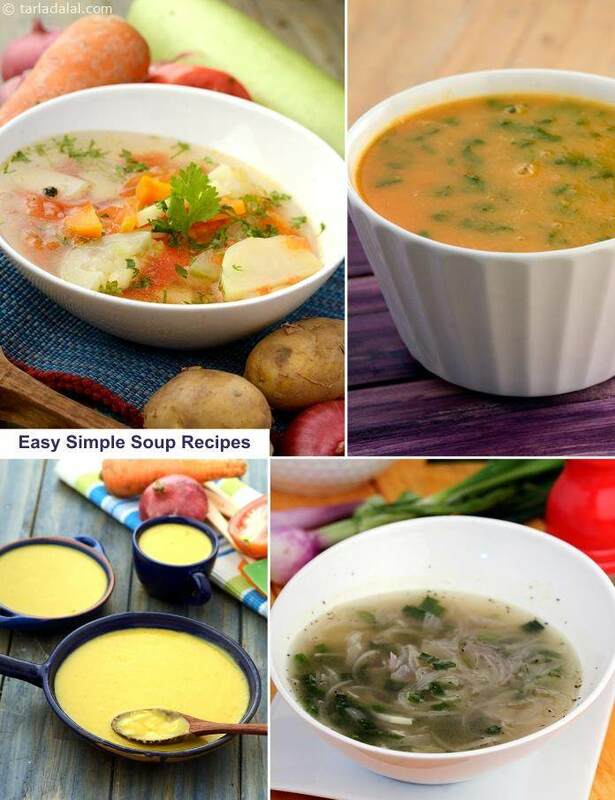 Simple soups, made without much fats or spices, are loaded with important nutrients, which will help you get better soon. On the same vein, tasty soups are also a smart way to sneak loads of nutritious veggies into your children’s diets. Elders who find it difficult to chomp their way through crisp veggies can also opt for soups to make up for their nutrient requirements. You sure don’t want to miss out on the benefits of the vitamin C rich Lemon and Coriander Soup, or the nourishing Moong Dal and Spinach Soup! Indeed, there is an unending choice of soups to choose from. And these apart, you can make your own delights too by throwing together whatever you find in your fridge! Be innovative with the seasonings and ingredient combinations, and you will soon realize that the world of soups is a limitless expanse, which can never be explored in its entirety!